EJ and I generally eat a healthy Korean-international diet. Well, at least I eat better than I used to. But then our bodies start coming to their senses and tell us we need junk food. We were out in the Beomgye neighborhood of my beloved Anyang a while back, scouting around for some dinner. There was a tteokbokki joint that I had always passed and wondered what went on in there. 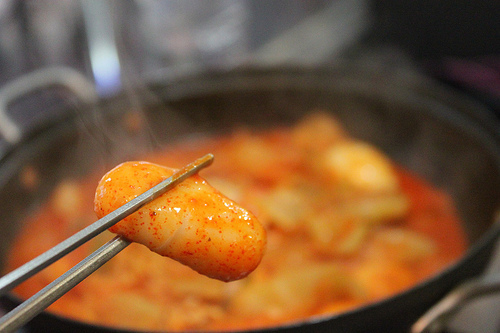 Tteokbokki is usually something served on a street cart. What would make this one so special that they’d put it up on the second floor of a building? It was definitely a place for cheap college food. Let’s see if we can do some forensics work on this one. Obviously we have tteokbokki. But we also have some cheese-filled tteokbokki. There are two pieces of fried mandu dumplings, two hard boiled eggs, some ramyeon and even some token vegetables. It didn’t take long for that big heaping mess to become a bubbling big heaping mess. And I always have said that the best food is the messiest food. There’s no way none of that won’t end up on your shirt. Ooh, some of that cheese tteokbokki! We actually ended up eating the entire pot, surprising even ourselves. It was quite satisfying. We haven’t been back, but I’m sure another junk craving will resurface in a year. My father in law always gets food all over his shirt too. Should I bring you some lobster bibs the next time I get to Korea? That looks delicious, even though it’s junk food 🙂 Is this made similar to how regular tteokboki is made? Yes. It just has more stuff. Beomgye Station, Blue Line #4. Exit 2. It’s on the right, 2nd floor. My search for this place failed. I’m pretty sure it’s not there anymore. I looked everywhere. Any suggestions on where else I can find something like this?